Полный, неадаптированный текст произведения. "Little Women" is one of the best-loved children's stories of all time, based on the author's own youthful experiences. It describes the family life of the four March sisters living in a small New England community; Meg, the eldest, is pretty and wishes to be a lady; Jo, at fifteen is ungainly and unconventional with an ambition to be an author; Beth is a delicate child of thirteen with a taste for music and Amy is a blonde beauty of twelve. The story of their domestic adventures, their attempts to increase the family income, their friendship with the neighbouring Lawrence family, and their later love affairs remains as fresh and beguiling as ever. 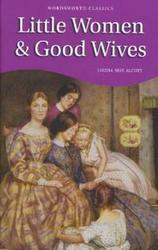 "Good Wives" takes up the story of the March sisters, some three years later, when, as young adults, they must face up to the inevitable trials and traumas of everyday life in their search for individual happiness.